On Thursday, the students will recieve a review to take home and will have more details on the concepts listed above. Don't forget to visit IXL to help review any topics that your child may be struggling with. Here is the link, maybe next you can try to Escape the Amusement Park? But who would want to do that! See you on March 18th! EXTENDED VACATION... WHAT CAN I DO? With March Break upon us (hooray!! ), some families are wondering what their child will miss if an extended vacation is taking place. Unfortunately, with the pace of our class at the moment it is easy for a child to fall behind if they miss a few consecutive days of school or even a week! Towards the end of March (about a week and a half after March Break) we will wrap up our unit on division. This past week we have been studying the basic division facts and how it relates to multiplication. Following the break, we will learn how we can apply the basic division facts to divide 2 and 3 digit numbers by a single digit. If your child is away, it is their responsibility to ensure that they have an understanding of this to the best of their ability upon their return. Here are some resources you can use to help guide your child in their self-directed learning. and much more! Just google "how to divide" or "division games" or "division worksheets"! See you after the break, have an enjoyable holiday. Spring is around the corner! We had a very, VERY fun Friday today playing around with the smartboard and easing into division. We reviewed the tricks and rules for divisibility. A number is divisible if it can make equal groups when divided with no remainders. We checked out StudyJams and sang some WONDERFUL karaoke! We also played a fun twist on Mahjong that uses division. Try out the sites again and get familiar with division... because here we go!! Enjoy! Things are going great with the multiplication unit. The students have been hard at work memorizing and understanding the tables... lots of skill, talent and confidence is growing. This week on IXL students have been encouraged to master at least 1 of the skills of their chosing in the D category (for the 4's) and the F category (for the 5's). Some of the skills take the basic knowledge we have built in class and take them a step further. We have not covered all of the concepts within these categories but students shouldn't be shy about reading the steps that are given in each skill and applying it to what they already know. We've also written some fun rhymes to help with memorization of the tables. Here are the links to the Smartboard activities the grade 4/5 class did on Friday which will further help in the development of these skills. Enjoy, and gear up... Division, here we come! We have been working very hard at mastering and memorizing our multiplication facts up to 10 this week in the grade 4/5 basement. We are doing this by thinking of strategies, looking at patterns on the multiplication table, skip counting, looking at multiples of any given factor, working in the textbook, and of course playing games and having fun! This week on IXL, students are expected to master D.1 and D.2 by Friday, February 8th. Students are also encouraged to try out some of the other skills in Multiplication (D category). - continue to engage in the IXL program with your child and keep the math talk alive! 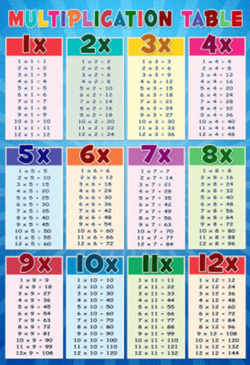 I have added some links to websites to help your child master their abilities in multiplication. We have only worked on 1-10 at this time, but will move on to extend this to 11 and 12 as well next week. Happy New Year! I am happy to be back online and updating the site. We've had a great kick-start to the new year in the grade 4/5 math program! As we start into term 2 we have begun using a wonderful resource called IXL. This week the grade 4's must master 2 skills: p.11 - Perimeter and p.12 - Area. The grade 5's must master 2 skills: b.14 - Perimeter and b.15 - Area. Each week they will be assigned a few skills and should try to master them by Friday of that week. Please do not hesistate to get in touch with me should this be a problem or if you have any questions! We've wrapped up our mini patterning and measurement units now, and moving into term two we will focus on Geometry, Multiplication, and Division from now until March Break. Stay tuned for more updates. Until then, stay warm and enjoy the canal!! Thank you SO much for your help with fundraising for Movember -- we have had an absolutely blast sportin' our mo's all over school. These past few weeks we have raised over $600 that will go to cancer research which will hopefully lead to a longer life of happiness in the future for our children. Please stay posted on the First Avenue website to see an exact amount raised and a school-wide photo of a 'stache! On another note... this website will no longer be updated. Unfortunately due to certain circumstances out of my control, the site will be hibernating for the winter. Hopefully we will be up and running again soon! Students, check out the links section... OKTA is ready for round 2! We have taken the plunge into operational sense over the past week or so, and are having so much fun! Starting with addition we are working on adding 3 and 4 digit numbers using a variety of strategies and skills to add the numbers up on paper and also building our abilities to do things mentally. As we work on our math skills we are looking at things from different perspectives to gain a deeper understanding of how we can really work with and manipulate numbers! Please take a look at the links section for more tools and sites to help your child become a mathematically inclined student and learn to get along with numbers rather than constantly turn to those trusty calculators! School Wide Surveys, The Final Product! We are happy with how the graphs turned out as part of our final project of the Data Management unit. We worked together to collect the information and present it as beautiful graphs. As a class we discussed how to put the graph together, the scale, the range, how to plot the graph, the subtitles, title, and more! Great opportunity to work as a team and present something to the school to be proud of! Way to go! This graph shows the number of treats collected by students in each grade level! This graph shows the time students began trick-or-treating and the time they finished! This graph shows the types of costumes the students dressed up at First Ave! Also, please stay tuned... I will be posting the pictures of our Halloween graphs that were created. We are so proud of them and are getting great feedback from the teachers, parents and students at First Avenue! Thanks to all the staff, students and parents who made this possible! We are all so excited that it is THAT time of the year again!! Who can say no to collecting free candy and dressing up? YES PLEASE! Tomorrow the grade 4's and the 4/5's will be going around the school conducting a school wide survey and we will graph them and display them for the whole school to see! Also, don't forget to complete your Halloween graphs by Friday, November 2nd! On Monday, each class looked at the line graph that weebly creates to show the traffic on the website. It was astonishing to see over 100 unique visitors to the site yesterday! On Friday I will post an image of what the graph looks like after a week of increased traffic and we will look at the how the scale and trend on the graph has changed! Don't forget to check out the new links under the student resources, make some graphs... view the videos... have some fun! Over the past few weeks and the next five or six weeks, the students will be diving into a world of measurement and data management. What a wonderful way to combine two important strands of mathematics! Measuring objects and then creating charts and graphs to show that data just seems to go hand in hand and this is exactly what we will be doing. Furthermore, we will continue to investigate different problems through discussion and group problem solving activities. Halloween is quickly approaching! The week of Halloween we will be conducting a school-wide survey and display it using graphs and charts. You can now check out the student resources section of the website for an updated list to include the most relevant links to help grasp concepts being taught in class! Remember to encourage your son/daughter take initiative and be an active participant in the journey of learning. We are just about to wrap up our first unit on Whole and Decimal numbers. We spent some time this week showing our stuff by completing an inclass assignment that involved writing cheques with really REALLY big numbers! The students did very well over all and its time to have the end of unit test to assess for learning of all skills and concepts taught. The students were given the review in class today and were told to complete this for homework tonight. If you have no problems with the review sheet, you will have no problem with the test tomorrow as it will follow the same format! To get the review sheet to help your son or daughter, download it below! The month of September is rolling to a stop and we at First Avenue in the grade 4/5 math clases have been having a good time! We want to share an activity we really love with our parents at home. Over the past week we have looked at decimal numbers, their place value, and how this relates to money! This was a big hit because of course... we all love money. Below you will find the downloadable activity sheet. Read the directions below and have some fun. Also, please be sure to check out the student resources for some new stuff to help you out with rounding and place value! The end of the unit is quickly approaching. You will need: 30 pennies, 20 dimes, 2 loonies, 2 dice, the money chart (downloadable), a partner, and willingness to have a good time!! Take turns. On your turn, roll the dice. The sum of the two dice tells you how many pennies to take. Place the pennies in the penny column on the chart. When you have 10 pennies you can change for a dime, and place the dime in the dimes column on the sheet. Finally, when you have ten dimes, you can exchange for ONE DOLLAR and you have won the game. Enjoy!! How Many one dollar words can you find? We have officially been in school for one week already! It is hard to believe, but time flies when we are having fun. Over the past week you may have heard we had some fun with names, numbers, money and more in our Math class. I encourage you to continue to work with your son/daughter as they take home activities and questions that engage critical thinking and problem solving skills. Such activities include finding one dollar words (which is listed on the assignments page), and the number 525,948.766 which students were encouraged to take home for discussion today. I will continue to update the home page in a blog-type format to keep you posted on changes on the website! Please see the student resources page as I have added 2 more links to help with the concept of place value which we have been discussing in class so far this week and will continue to work on. Also, I have added some information regarding Meet the Teacher night and what to expect under the School Announcements page. I am working together to create a contact list with the e-mail addresses provided. This will take some time, so I encourage you to continue to check out the site and provide your feedback. Happy new school year 2012-2013! I would like to welcome back all of our students as well as a warm welcome to all the new faces as well! We are gearing up for a wonderful year together, and I am very excited to have the opportunity to teach the grade 4's and 5's this year! Please use this website to stay informed on the on goings within the classroom. Over the year newsletters, assignments, resources, and much more will be added to the site. I will inform the students when changes are made to the site, and when assignments/resources are added. I encourage parents and students to browse the website to get familiar with the program and learn more about me. If you have any further questions or comments, please do not hesitate to contact me.